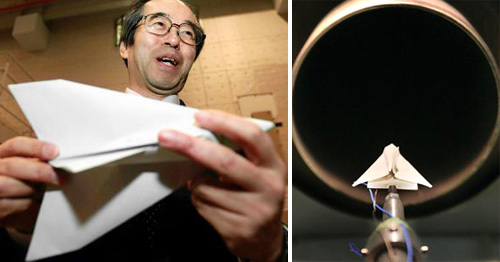 Japan Aerospace Exploration Agency To Launch The World's Greatest Paper Airplane From Space | OhGizmo! Any kid who’s ever made a paper airplane has dreamed of throwing it off a tall skyscraper to see how far it can actually fly. And at least one kid who grew up to become a professor at Tokyo University’s Department of Aeronautics and Astronautics has held onto that dream. But why stop at tall buildings or even mountains? Shinji Suzuki currently heads up a project that wants to launch paper airplanes from space, and see how they survive the trip back to Earth. The first issue that comes to mind is that the real space shuttle requires bleeding-edge, heat-resistant tiles in order to survive the trip home. How would a paper airplane even have a chance? Well the origami paper they intend to use is made of sugar cane fibers sprayed with a special coating making them resistant to heat, wind and water. Shockingly, a 2.8 inch long prototype has survived speeds of Mach 7 and temperatures up to 446 degrees Fahrenheit in a hypersonic wind tunnel. So believe it or not, the plane could probably survive a trip through Earth’s upper atmosphere. The actual paper airplane they intend to launch will be about 8 inches long, 4 inches wide and weighs about 1.05 ounces. Their last big hurdle before the ‘launch’ is to find a way to reliably track the airplane once it has been released. Otherwise the $300,000 in funding they get each year for the project will be wasted if they aren’t able to learn anything from the flight. Back in the 70s I was on a college trip to New York City and one of my friends made a paper airplane and smuggled it to the observation deck of the Empire State Building. We stood around him blocking the view of security guards while he launched it. It was a sublime and beautiful experience. We stood there watching the airplane make lazy circles in rising air out over Manhattan for quite a long time. It still hadn’t lost any altitude when we finally left. I didn't notice this post is a year old. Still interesting though.